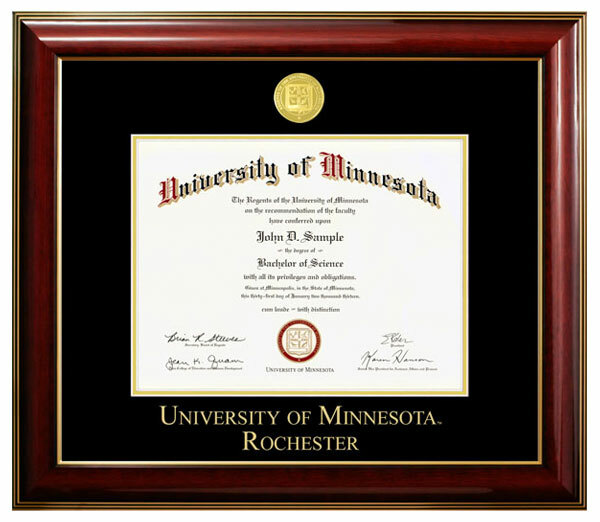 Show off your diploma with this classy Gold Medallion diploma frame. A premium quality, high gloss moulding, mahogany finish complements home or office decor and features Gold Trim with a Black Mat. This most popular Classic line is sure to please the most discriminating alumni. This frame offers the option of three different glass types: Non-UV Protection, UV Protection, and Museum Glass. This mat is specific for graduates from the University of Minnesota, Rochester. Dimensions: 16¼ x 18¾. Fits an 8½ x 11 diploma.